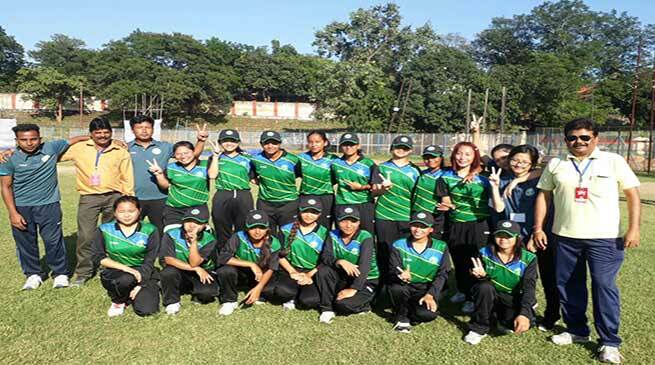 Arunachal Pradesh today registered their second consecutive win in the ongoing Women’s Cricket under 19 One Day League and Knockout tournament organised by Board of Control for Cricket in India defeating Sikkim by 80 Runsplayed at Railway Stadium, Dhanbad. Arunachal after winning the toss decided to bat first and scored 157 in 34.4 over. Kalra, K Kaithl and Nadek Nabum scored 38, 31 and 7 runs for the winning team. Y Lepcha, T.C Lepcha 2 wickets each while Archana Limbu, Pratika Chetry S Gurung, N P Lepcha and D Lecha took wickets each for Sikkim. Chasing the target of 157, Sikkim all out in just 77 runs in 33.3 overs. N P Lepcha and S L Lepcha scored 15 and 11 runs respectively. R Yadav and K Kaithl took 4 wickets each while Nadek Nabum took 1 wicket for Arunachal Pradesh.